Robine Clignett (1948) participates in the Watou festival. This 38th edition of the yearly festival brings together artists, writers and poets in the Belgian village of Watou, near the French border, under the thematic On Longing and Consolation. The essay Het wankele evenwicht van het verlangen (The unstable balance of desire) by writer and poet Bernard Dewulf forms the starting point and inspiration for the selected participants. To accompany the above essay, Dewulf wrote an additional essay on consolation. 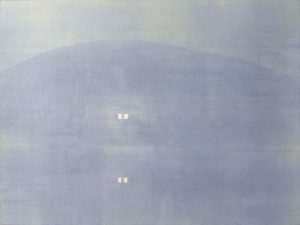 Robine Clignett shows a work from 2008 that was inspired by a voyage to the Outer Hebrides, the group of islands off the north west cost of Scotland. Visitors of the festival can follow a route mapped through the village in order to view artworks, attend performances, participate in happenings and other events.